Galley Wench Tales: New Zealand Bay of Islands: Arrived! its excellent cruising grounds and sailing resources. 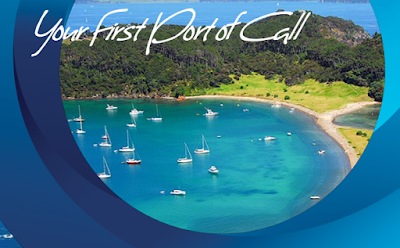 Opua, New Zealand, beautiful gateway to "The Bay of Islands." After over 1,000 "as the crow flies"* miles and three weeks since we left Nuku'alofa, Tonga, we arrived in New Zealand. It was our last long passage for at least the next five months, as we plan to nestle safely here for the cyclone (that's hurricane, South Pacific-style) season. *Often sailing requires many more miles than it appears to, due to the need to zig-zag rather than sail along in a direct line from departure to destination due to wind, waves of obstructions. We motored the most we ever have to avoid getting walloped by the storm system at our heels. Sailors to New Zealand are pretty much guaranteed to hit at least one stretch of heavy winds and at least one stretch of inadequate winds. Hmmm, makes us cruisers seem pretty picky.... Seriously, it's difficult to expect a mellow trip in, so we are relieved to be done. Heavy winds are not only uncomfortable, it's the kind of weather most likely to cause boat damage. Too little wind to sail, and cruisers run the risk of running out of fuel (few boats can carry enough to motor for more than a few days) too early, and finding themselves a sitting duck when the time comes to run from upcoming bad weather. We arrived yesterday afternoon, and found ourselves caught up in a whirlwind of customs and immigration inspection, moving to a marina slip to rest, repair and reunite with our fellow South Pacific Cruisers. "How was your passage?" is one of the most common cruiser questions here. "We're just really, really glad to be here," we answered. And truly, if measured by boat damage, the only issue we encountered was one torn mainsail seam (the next to last one to go on that sail) and in the last eight miles, the pin on our autopilot sheared (fortunately, we have a replacement pin and an additional spare beyond that). More soon, including some more retrospectives from Tonga, Minerva Reef and other recent South Pacific stops. Opua, New Zealand, Bay of Islands Marina (S35.18.825 E174.07.312).